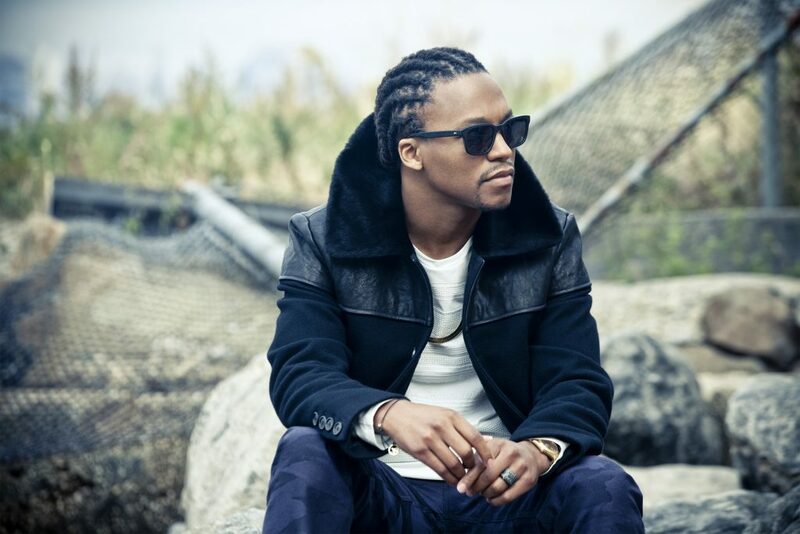 Grammy-winning musician Lupe Fiasco will perform at Dodger Stadium before the Dodgers’ 5 p.m. game Sunday against the San Francisco Giants. The performance is free to fans with a ticket to the game, and comes a day after Robin Thicke takes the Dodger Stadium stage, all part of the Dodgers’ Opening Weekend, presented by Bank of America. Turnabout is fair play. Today, the other MLB teams get their turn, and we watch. As far as the National League West goes, 1993 expansion partners Colorado and Miami (nee Florida) play at 4:05 p.m., with San Francisco at Arizona at 6:40 p.m.
Two innings away from a 3-0 start to the season, the Dodgers didn’t even get to the bottom of the ninth Sunday, surrendering Hyun-Jin Ryu’s impressive outing in a 3-1 loss to San Diego. Brian Wilson shouldered the blame. The reliever, who allowed only one run with the Dodgers last year, matched that when he allowed a game-tying homer to pinch-hitter Seth Smith. Overall, Wilson gave up three in the bottom of the eighth — two earned, one unearned as the result of his own error. Last year, Clayton Kershaw went 19 innings before allowing his first run of the 2013 season. Hyun-Jin Ryu is approaching that neighborhood. You can start the early campaign: Hyun for Cy Young. Before Brian Wilson allowed three runs in the bottom of the eighth inning in the Dodgers’ 3-1 loss to the Padres (recapped here by Ken Gurnick of MLB.com), Ryu followed up his five shutout innings in Sydney with seven in Sydniego. It was a performance that quickly went from struggling to sterling, putting to rest any post-Australia concerns about toeture. Struggling with location in the first inning against the Padres, particularly on outside pitches, Ryu loaded the bases with one out on a single and two walks. But the lefty turned Yonder Alonso’s comebacker into a 1-2-3 inning-ending double play. 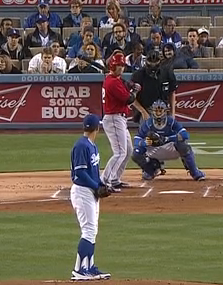 After allowing singles to the first two batters in the bottom of the second inning, Ryu went into high gear. He retired 16 batters in a row into the seventh inning, walked Tommy Medica, then drew his second double play, a 3-6-3 special off the bat of Will Venable. Despite throwing 21 pitches in the first inning, Ryu finished with only 88, meaning he averaged 11.2 pitches over the final six innings. Staked with only the one run the Dodgers got in the fifth inning off Padres starter Andrew Cashner, he needed to be that good. 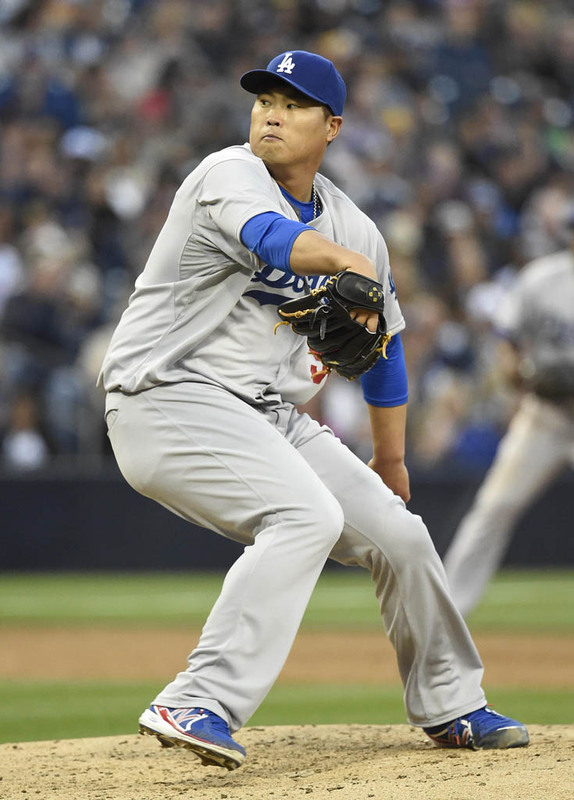 In his 12 innings this season, Ryu has allowed only five hits while walking four and striking out 12. According to Baseball-Reference.com, Ryu is the eighth pitcher in Dodger history and fifth in Los Angeles to pitch at least 12 innings of shutout ball in his first two starts of the year. Having left his infielders with almost nothing to do in the Australia start, Ryu instead starved his outfielders tonight. Yasiel Puig caught two flies, Carl Crawford one and Andre Ethier none. March 30 pregame: How does the NL West race look? Dodgers at Padres, 5:05 p.m. Believe it or not, the other teams in baseball do intend to play regular-season games this year. I know — who knew? Weather permitting, by bedtime Monday, there will be no 0-0 teams left in the National League West. 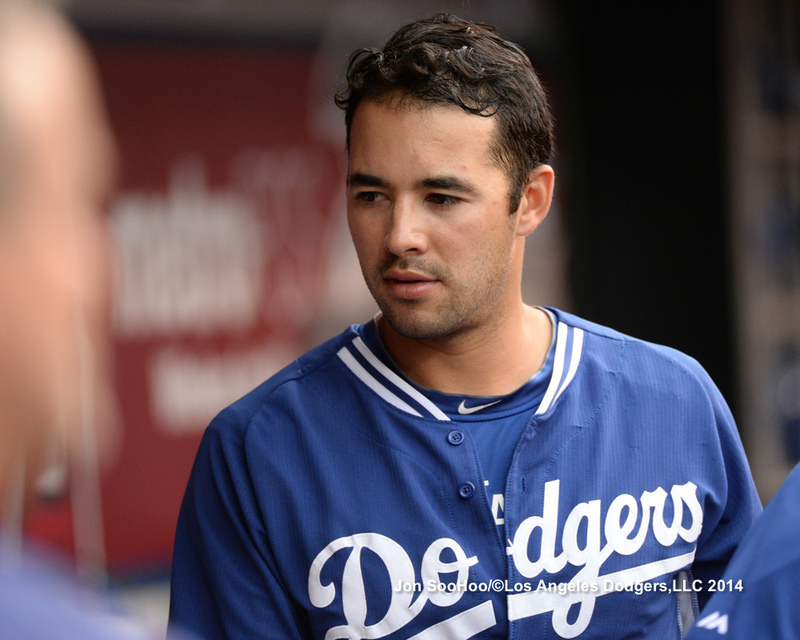 The contemplative Andre Ethier and the Dodgers are the divisional favorite, but who’s the pick for top challenger? San Francisco is the consensus selection of the six national publications below. Over at least the next 10 days, or until Katniss Kershaw returns from the disabled list, I’ll think of it as the kill-or-be-killed symbolic backdrop for the 2014 season. 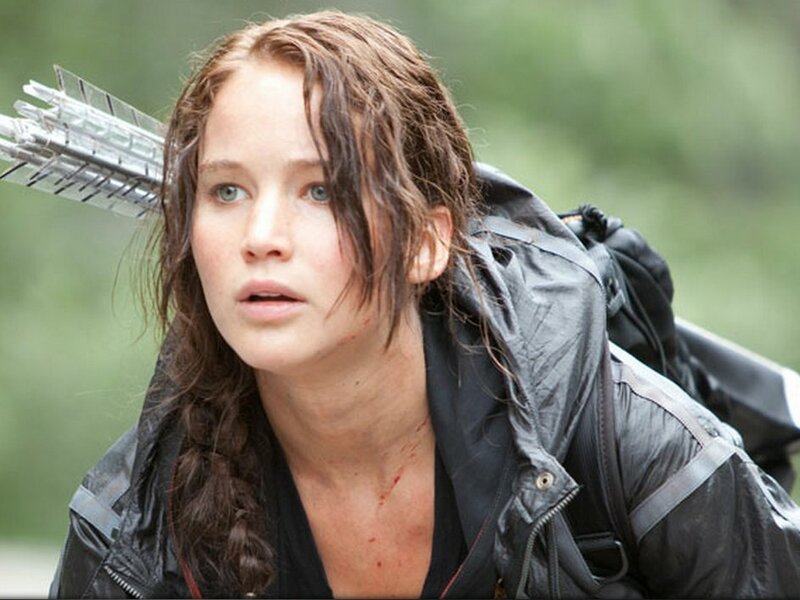 The numbers almost track — 24 “tributes” in “Hunger Games,” 30 Major League teams. Or, if you prefer, 24 tributes juxtaposed against 25 active players on the Dodgers’ regular-season roster, each just trying to survive in a cutthroat world that sometimes seems capriciously manipulated from outside forces. The swirling national circus might not like the Dodgers, might see them as villains, but more often than not, they have nevertheless been impressed by them, crowning them 2014 favorites at least as much as any other team. For their part, the Dodgers seem ambivalent about how much they care about being liked, but they are determined to survive until the very end. No, I suppose no one will confuse Los Angeles as MLB’s District 12, though I think outsiders sometimes underestimate the toll and poverty of 25 years without a title, a span of time in which about half the teams in the Majors have triumphed, including a few of the supposedly less fortunate. When the Marlins have more than one World Series ring since your last, when your top historical rivals can say the same, it’s hard to feel too much sympathy. In any case, the gamemakers have rejiggered the competition. Celebrate the best in baseball, then impale with a fireball, this one striking in the teres major muscle. So OK, that’s how we’re gonna play it. No one gets out of here clean, not even the supposedly blessed. 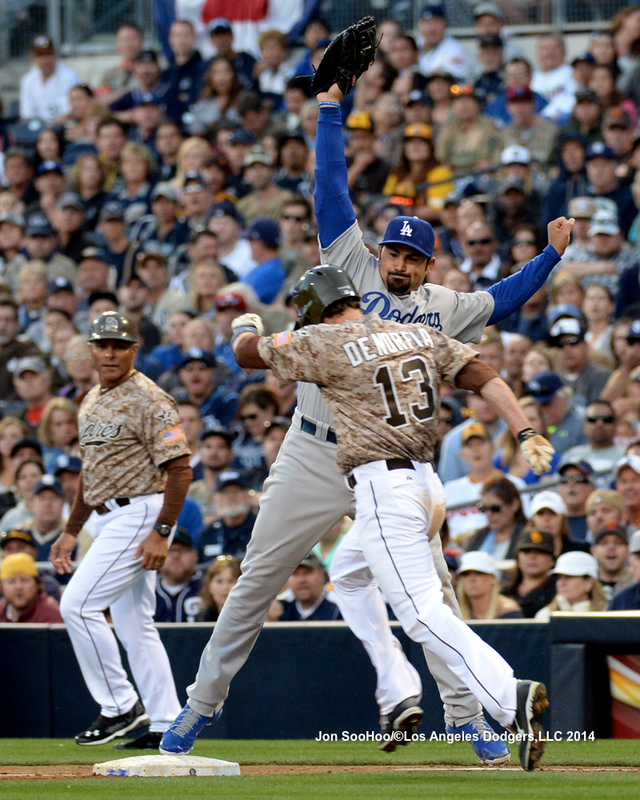 The Dodgers are going to battle and bleed like everyone else. 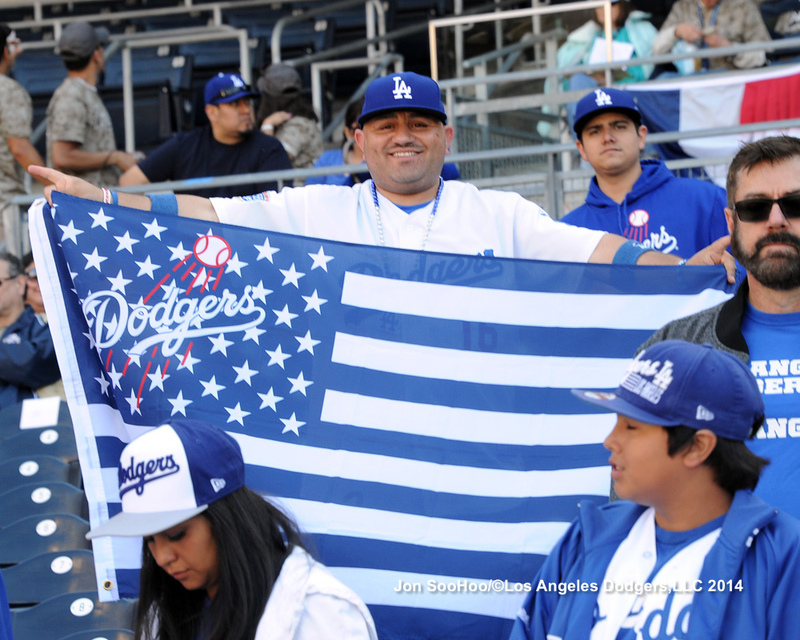 The savage season, these Hunger Games, resume in earnest at 5:05 p.m., when the Dodgers face San Diego in the first official 2014 game on U.S. soil. Be great, be strong, be resilient … and be on the fates’ good side. Dodgers at Angels, 6:05 p.m. So it has happened: Clayton Kershaw is heading for the disabled list. It’s not the first time he has missed a start in his career, though that is rare in itself. But it is the first time he has been placed on the DL. Kershaw was throwing off flat ground in right field with trainer Stan Conte earlier Saturday, gradually increasing the intensity and distance of his throws. Once he felt something, on the 27th throw, he immediately ceased throwing. Kershaw could next pitch as early as April 8 against Detroit. 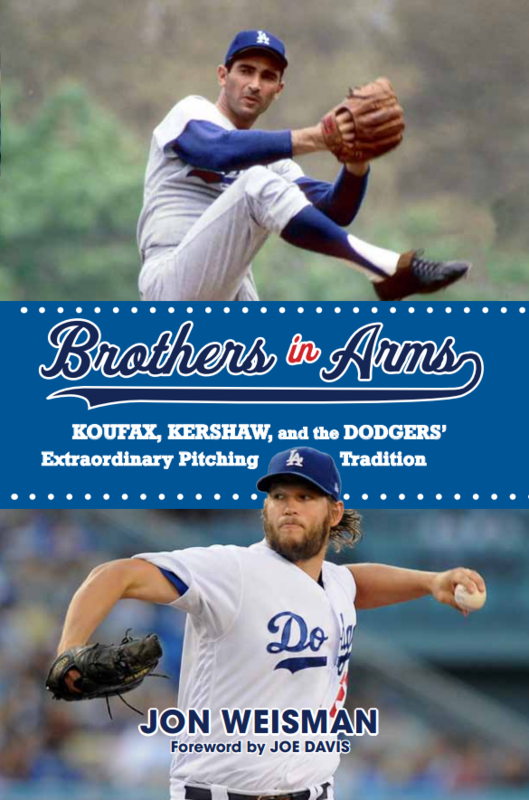 That potentially could be a matchup of 2013 Cy Young Winners: Kershaw and Max Scherzer. Jose Dominguez, meanwhile, was optioned to Triple-A Albuquerque. 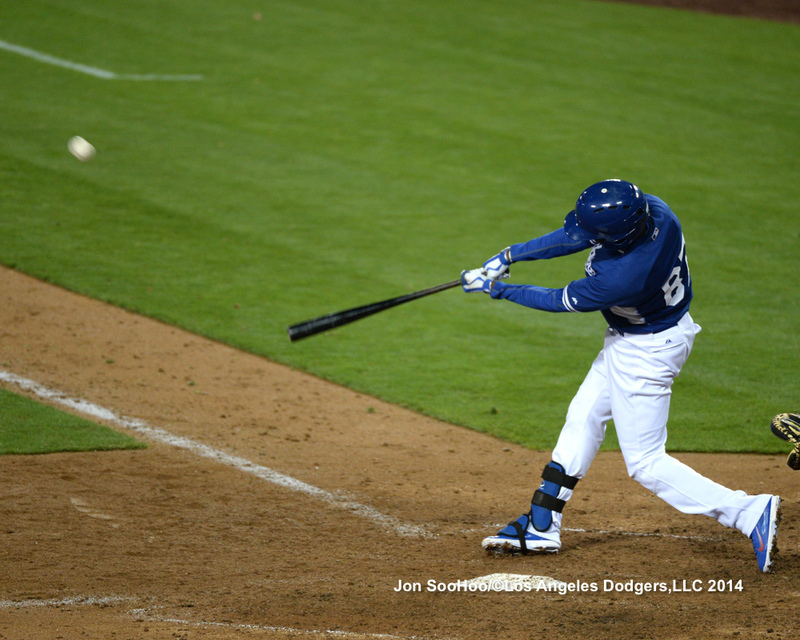 Darnell Sweeney strokes the game-winning hit in the bottom of the 10th inning of the Dodgers’ 5-4 victory over the Angels on Friday. Hyun-Jin Ryu has been cleared to start Sunday’s domestic opener at San Diego. In theory, Zack Greinke and Dan Haren will start the next two games, Tuesday and Wednesday, with Clayton Kershaw a strong possibility to take the mound in front of Dodger Stadium fans Friday against the Giants. As Scott Miller writes for MLB.com, Kershaw’s situation is still a bit fluid. Kershaw’s next step will be to throw with a little more intensity and see how he reacts to that. “We’re not ready to put a timeline out there,” (Don) Mattingly said. “The next few days will be a little barrier to cross. If not Kershaw, the honor of starting the home opener could go to Josh Beckett, who wasn’t expected to make his regular season debut until mid-April. Paul Maholm appears ticketed for long relief unless other injuries come up. Haren, by the way, will start tonight’s exhibition finale against the Angels in Anaheim. Major League Baseball and the Players’ Association have agreed on stiffer penalties for using performance-enhancing drugs, as Paul Hagen writes for MLB.com. A first-time offender will receive an 80-game suspension, up from the previous 50 games. A second violation will result in a 162-game suspension and a loss of an entire season (183 days) of pay, up from 100 games. A third violation will lead to permanent banishment. Any player disciplined for a violation involving performance-enhancing substances will not be allowed to participate in the postseason and will not be eligible for an automatic playoff share. Scott Miller quotes the positive (pun not intended but acknowledged) reaction to the changes from A.J. Ellis and Adrian Gonzalez at MLB.com. Considering he left the game trailing 4-1 after five innings, Zach Lee can take something positive away from his Dodger Stadium debut tonight. For one thing, he made his Dodger Stadium debut tonight. Let’s not pretend that’s not meaningful for an up-and-coming big leaguer. But beyond that, after giving up a leadoff walk to Kole Calhoun, a single to Albert Pujols and a rock-solid home run to Josh Hamilton in the first inning (and then committing a throwing error to start the top of the second), Lee battled back and showed off some resiliency. He allowed one run on three hits and a walk over his final four innings, striking out two. He induced inning-ending double-play grounders in the second and fourth innings, along with four other individual groundouts. He finished his night with a perfect fifth inning, capped by getting ahead of Pujols in the count 0-2 on his way to a grounder to second. Would Lee like that first inning back? Sure. But he’s faced Pujols and Co. at a Major League park and lived to tell the tale. Something to take with him as he moves closer and closer to his official big-league debut. Matt Kemp is looking like a better and better bet to be activated from the disabled list on his first day of eligibility, in time for the Dodgers’ home opener April 4. “I’ve progressed a lot since they left for Australia,” Kemp said. “I’m ready to go. … All I’ve been doing is working. What they were doing in Spring Training, I kept doing in Arizona. 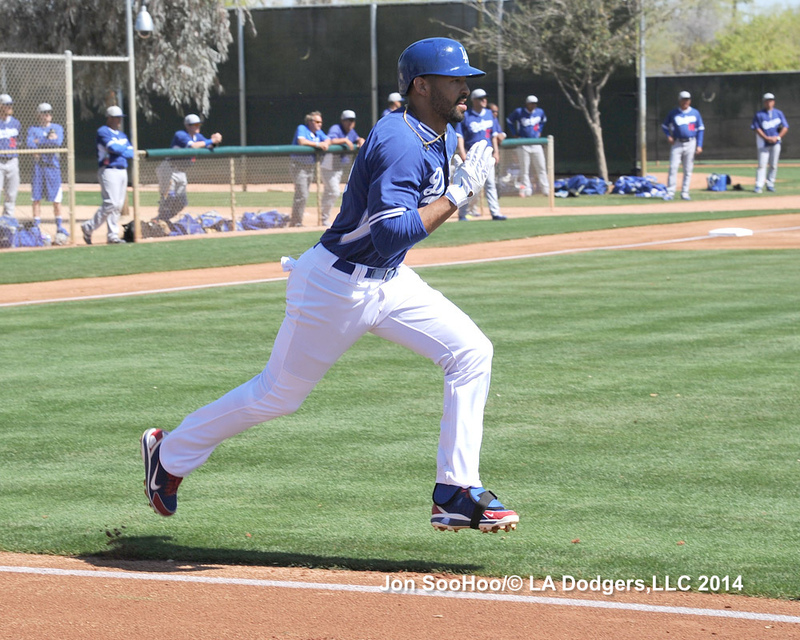 Kemp indicated that he had checked off every box of his long rehab, including the last hurdle of running, and was even stealing bases in Arizona. He had been forced to learn patience through his long comeback process, and is eager to reap the benefits. “I wouldn’t be playing if I wasn’t 100 percent,” Kemp said. Now, that was a nice battery. 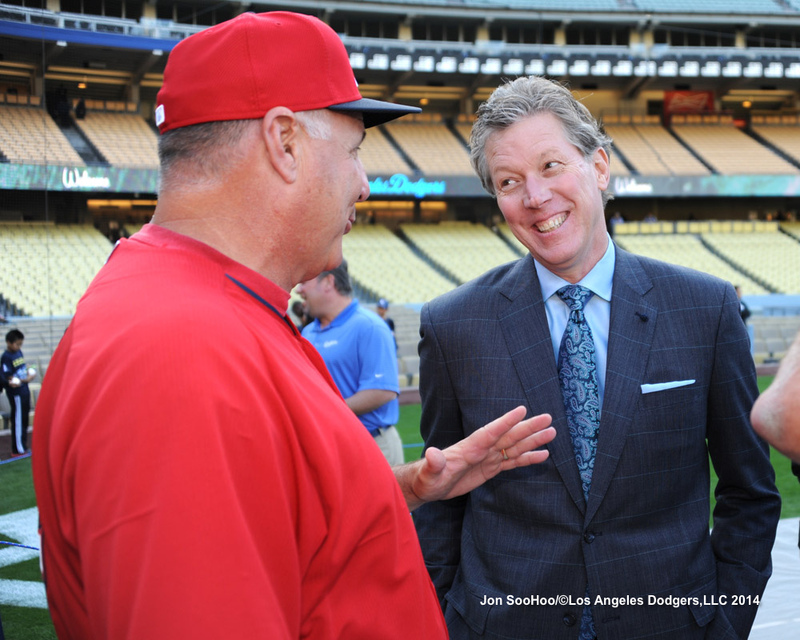 True or false: Mike Scioscia caught Orel Hershiser’s first Major League start. Answer below. So we’ve collected a bunch of photos from before and during Thursday’s Dodger Stadium exhibition opener against the Angels to show what life is like in the new outfield plazas. “Some wonderful changes at Dodger Stadium,” as Vin Scully said Thursday. “You can have something to eat or drink. You can sit there and look down at each bullpen and watch the process of a Major Leaguer getting ready. And of course, a lot of conviviality as people get to know each other and share the experience of coming to Dodger Stadium.